With the base of the workbench done, it is time to tackle the slab top. I quickly realized that I needed a little more ammunition in my arsenal to handle the cuts that I want to make, so I had to order extra long jigsaw blades. While waiting for them, and with slightly warmer weather predicted, I decided to tackle a commission for 3 saltboxes. These make a good weekend project. 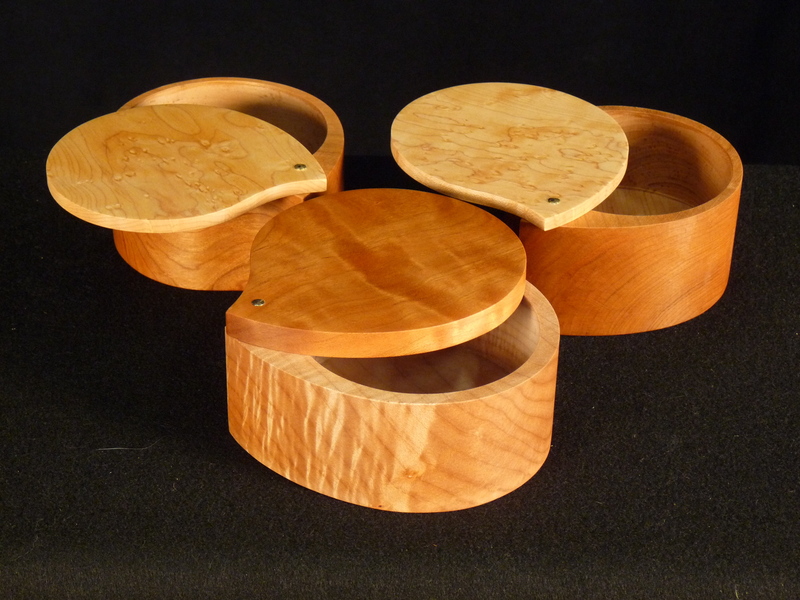 I will make two with a cherry base and birdseye maple lid and one with a curly maple base and a figured cherry lid. 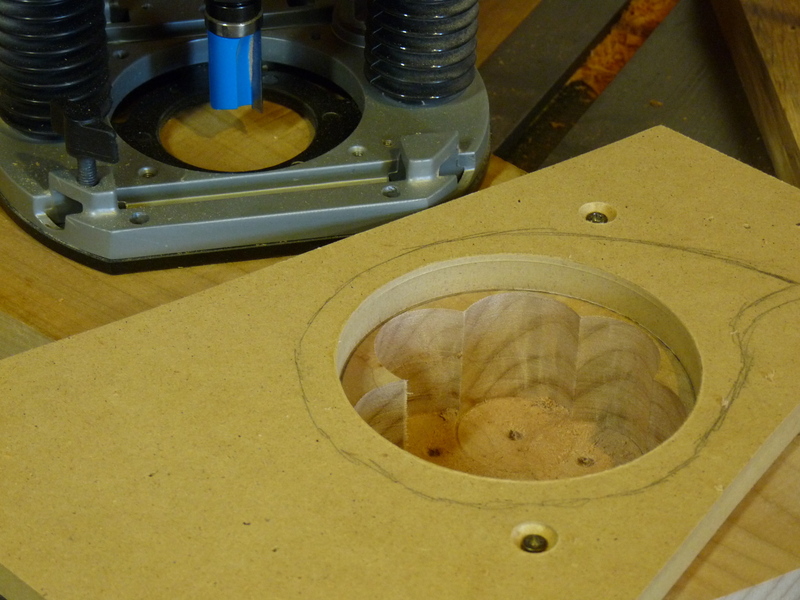 After the forstner bit has done its job, I attach a circle template with screws in a waste area of the wood and rout to the template with a pattern makers bit. 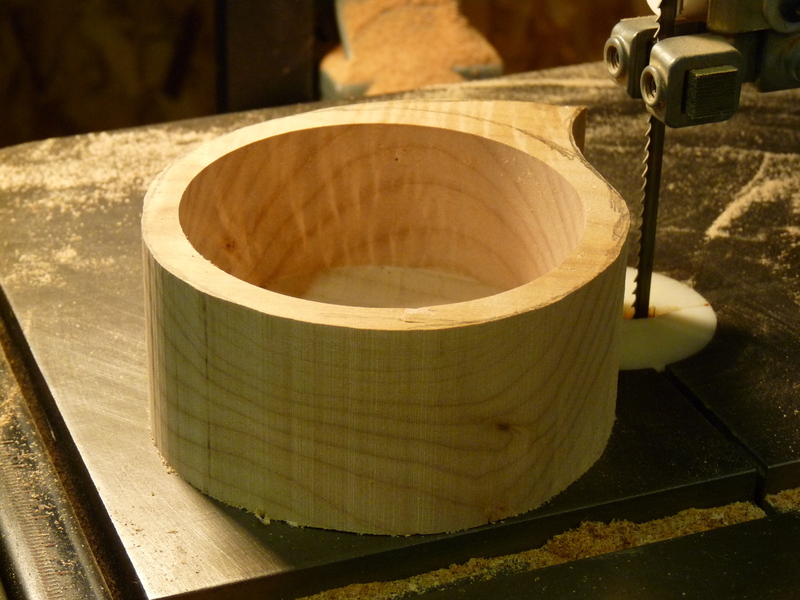 While I am using a circle, you could be a creative as you want with the bowl part. I rout in multiple passes, until I am past any forstner bit marks on the bottom. 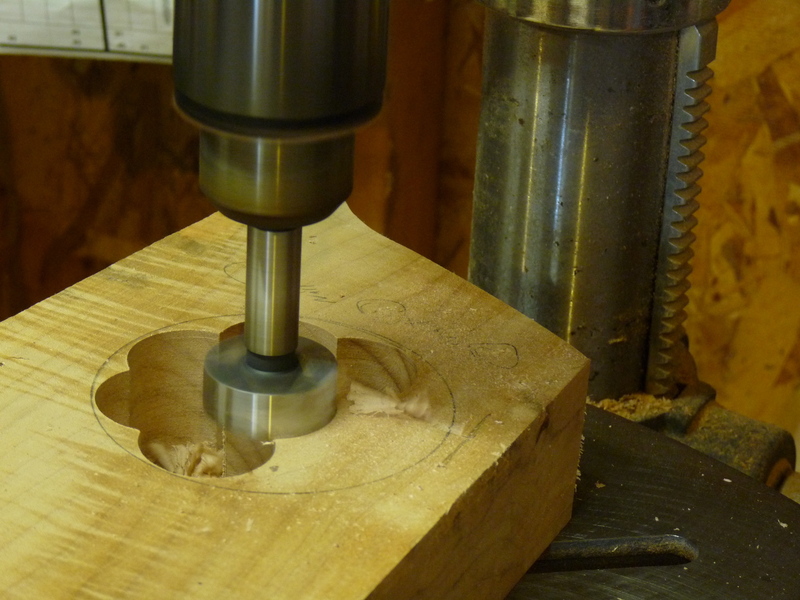 After routing I draw the outside shape, leaving an area for the pivot pin. While I could make a template for this, I just draw the outline by hand. Its not that complex, is good training for my eye, and adds a little hand made uniqueness to each piece. 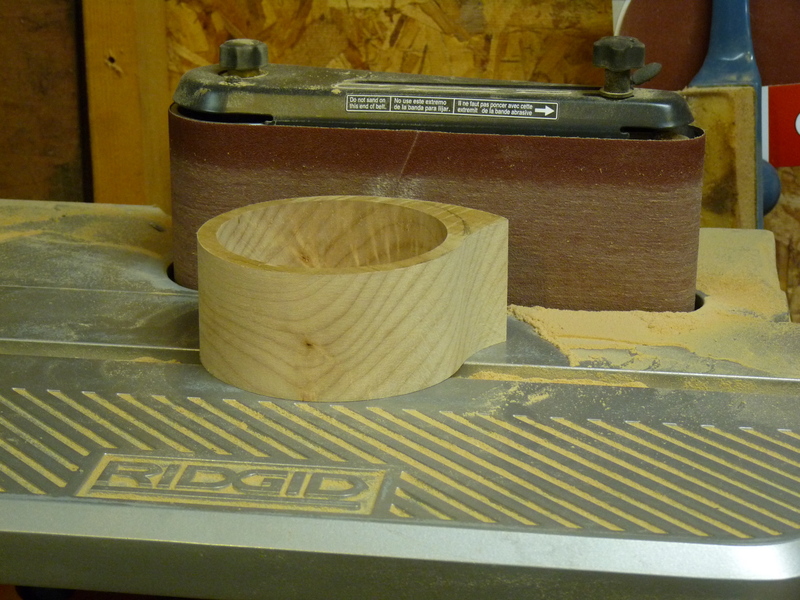 Then its over to the bandsaw to cut the rough shape just outside the line. Next step is to remove the saw marks and refine the shape. Now, if you don’t have an oscillating belt or spindle sander, I would advise against this project. While I’m sure you could figure out other ways to shape it, the oscillating sander makes the process so easy. I start out with an 80 grit belt for the initial shaping and finish with a 180 grit belt for final smoothing. A word of warning. Be careful when you are working with the 80 grit belt; its aggressive bite can grab the piece and propel it across the room. (Don’t ask me how I know.) So make sure you have a good grip on the piece! With the box complete, its time to address the lid. 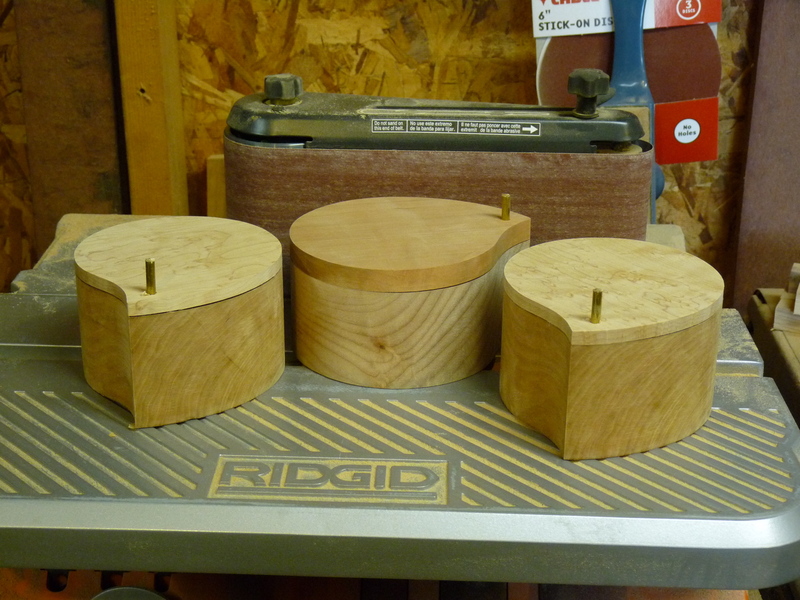 After milling the stock to thickness, I trace the box shape onto the lid and cut it out at the band saw. 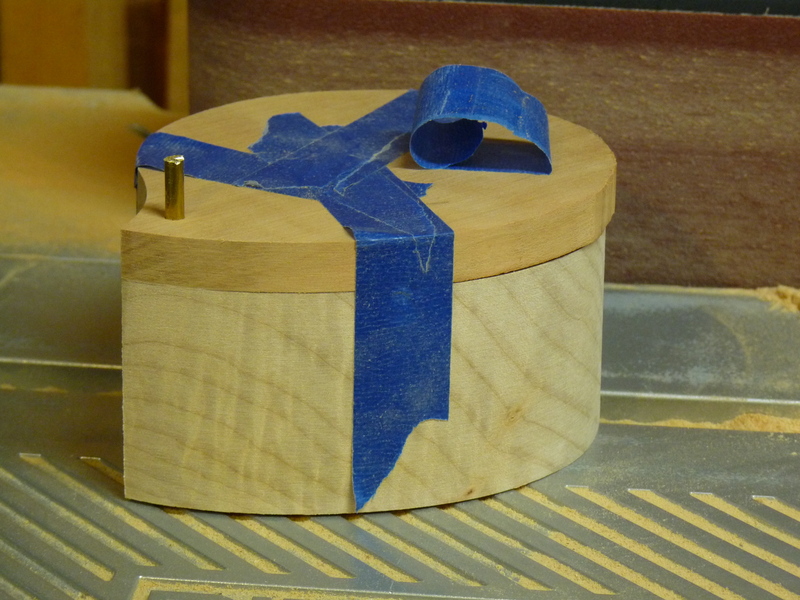 Next, I tape the rough lid to the box and drill for the pivot pin. I am using 3/16″ brass rod. With the pin in place, I can go to the sander and, by removing the tape one area at a time — and then retapeing after sanding — I flush the lid to the contour of the box. Then, with all of the tape removed, I do a final sanding with the 180 grit belt; being VERY careful to keep the lid and the box lined up. Since the 180 is far less aggressive than the 80 grit belt, this is not too hard. After hand sanding to 220 grit, its off to the finishing room. Since this is intended for extended food contact, I only finish the outside with a couple of coats of Danish Oil. This brings out the character of the wood while leaving it with a natural feel. With salt inside, any moisture will soon get absorbed. After finishing, I peen over one end of the brass pins, put a drop of thick CA glue in the pin hole in the box and attach the lid. This will keep the lid tight while still being able to pivot open. All ready to dole out pinches! This entry was posted on February 4, 2011 at 2:29 pm and is filed under Acorn House. You can follow any responses to this entry through the RSS 2.0 feed. You can leave a response, or trackback from your own site.